July 30, 2017 Michal B. Most tourists visit the Czech Republic’s capital to enjoy its numerous sightseeing treasures. But Prague also offers an amazing experience to all animal lovers. 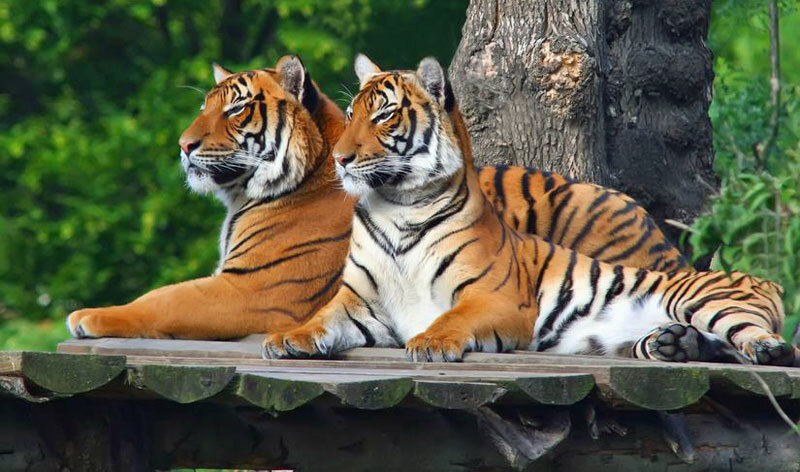 In the Troja quarter of the city, next to a beautiful eponymous Chateau (Zámek Troja), one of the best zoological gardens in the world is awaiting its nature loving visitors. Prague Zoo covers an area of over 0.5 square kilometers (about 60 hectares), in which it houses more than 4 thousand animals of over 650 species, including a large number of those listed as threatened. Prague Zoo was opened to the public in 1931, but its history reaches much further back in time. That is to the year 1881, when Count Sweerts-Sporck (hrabě Špork) initiated the establishment of a zoo in Prague. The process took place over the following decades and involved, among other things, the emergence of The Association for the Establishment of a Zoological and Acclimatization Garden. Another important milestone was the donation of land in the Prague borough of Troja for the zoo to be built there by a very rich farmer, Alois Svoboda. Finally, on the 28th of September 1931, Prague Zoo was officially opened. The zoo has been continuously developing since then, and nowadays is allegedly the 4th best zoological garden in the world. The very successful operation and continuing development of Prague Zoo was discontinued and even threatened by major floods several times. The worst ones struck the Troja quarter in 2002 and 2013. The biggest one in the history of the zoo was that of 2002, when Prague (as well as a significant part of Europe) was hit by the so-called “millennial floods”. The water levels reached over 7 meters above the landscape and many animals in the zoo unfortunately became victims of the floods. The flood-wave in 2013 was catastrophic as well, but this time the zoo’s employees were better prepared and managed to evacuate almost all animals from the flood plains in time. The damages brought giant costs nevertheless. We’ve already mentioned Prague Zoo’s gorillas. 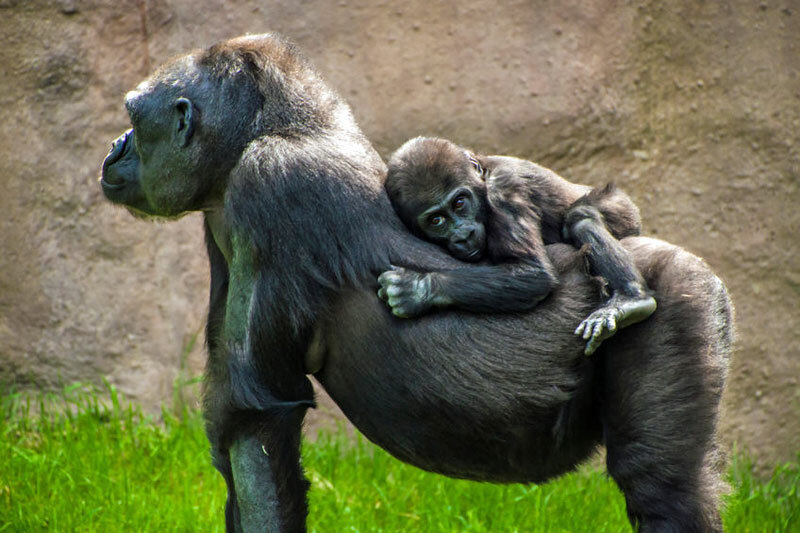 One of them, a female Western Lowland Gorilla called Bikira, was voted the most popular celebrity not only of Prague Zoo, but all Czech zoological gardens. The recognizable gorilla, who is unique thanks to, among other things, her lightly pinkish lips and upright walking, is very friendly and gentle. 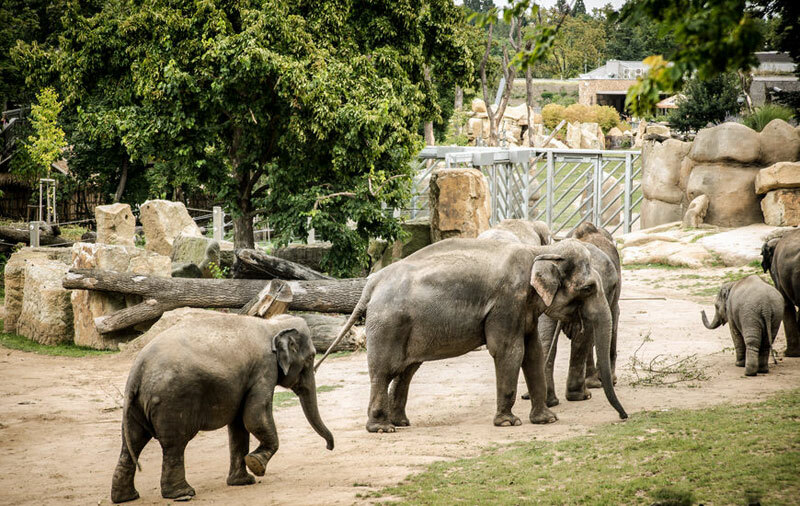 If you like elephants, the giant but usually quiet and tender mammals, visit the Prague Zoo’s Elephant Valley. And when you are there, pay special attention to Shanti, the Asian elephant who is also an artist. She became very famous when the caretakers discovered her creative talents, and her abstract paintings were even displayed in galleries and some of them sold at high costs. Other very interesting dwellers of Prague Zoo live in the above mentioned Giant Salamander House, which was actually built as a tribute to them. That is because salamanders are especially popular in the Czech Republic, thanks to one of the country’s most famous writers Karel Čapek and his legendary book “War with the Newts”. Yet another tender giant of Prague Zoo can be found in the Hippo Pavilion. Slávek, the captive born hippopotamus, is very calm and tolerant. Despite his three-and-a-half-ton body he is not as dangerous as hippos tend to be and he earned his nickname: “the gentleman” because it is even possible to keep the calves around him. The youngsters usually need to be isolated from the hippo males in order to protect them. You probably would not want to visit any zoo without seeing some big beasts, and Prague Zoo can definitely satisfy your needs. One of the major successes of the zoo is that the garden is the only one in Europe with Asiatic lions that have come directly from their Indian homeland. Visit them in the Feline and Reptile Pavilion, together with other amazing animals. Kawi, the Malayan tiger, came to Prague directly from Borneo to thrill you with his stripy fur. Even though Kawi is surprisingly calm when meeting people, he turned out to be quite unfriendly towards tigresses, so it will probably only be possible to use him for the zoo’s breeding efforts via artificial insemination. For a heavy dose of cuteness, pay a visit to Pat the lesser panda, who, together with his mate Maria, gave the zoo its first native-born panda cub. The rare little carnivores, sometimes also called red pandas, belong among many endangered species living in Prague Zoo. The garden’s efforts in the protection of animals and credit for keeping threatened animals from extinction is well acknowledged. Also various kinds of tapirs are listed as endangered or vulnerable. So it is rare thing indeed that you can see Malayan tapirs in Prague Zoo. Indah and Niko, the garden’s representatives of a very rare kind of these odd-toed ungulate species, are still subjects of breeding efforts. To properly enjoy everything Prague Zoo has to offer, you should plan your visit as an all-day trip. But if you only want to spend a few hours there, consider our must-see tips. Even though it is quite difficult to choose from the rich variety of nature’s wonders, you can still see many of them in the zoo. Apart from the below mentioned (in more detail) expositions, you should know that the Prague Zoo played a significant role in saving the Przewalski’s horse. The last wild horse, which became extinct in the wild during the second half of the 20th century, is kept alive as a species in Prague Zoo, which is also breeding it and sending specimens to other countries. This unique ungulate can not only be seen in the zoological garden, but also belongs among animals you can “adopt” within the frame of a very interesting and successful project. One of the most fascinating exhibits of Prague Zoo is its Giant Salamander House. In the breathtakingly constructed premises you can admire the world’s biggest amphibious creatures – Chinese Giant Salamanders, often called “freshwater panda”. This species, native to Chinese mountain forests, are sadly on the verge of extinction. In the Gorilla Pavilion you can visit probably the biggest “celebrities” of Prague Zoo, gorillas Richard and Bikira together with their incredibly cute offspring. This gorilla family, widely beloved by the public, share the wild forest resembling pavilion with other monkeys. All lovers of cute and funny pinnipeds must not miss Prague Zoo’s Fur Seal Exhibit, where they can watch fur seals in their giant swimming pool. From the recently reconstructed grandstand, you can also enjoy training sessions, during which these amazing water beasts perform incredible acrobatic exercises. And if you are visiting the zoo with your children, take them to the Children’s Zoo, offering a rare opportunity to not only see, but even pet the cutest domestic animals. Kids and adults alike will fall in love with rabbits, goats, horses, and other domestic animals both common and rare as they cuddle, ride, or feed them. The Prague zoological garden is located at the address U Trojského zámku 3/120, Prague 7 – Troja. You can take a bus there (to “Zoologická zahrada” bus station), for example number 112 from “Nádraží Holešovice” metro station. If you want to arrive in style, from March to October you can take a steamboat (ferry). The ride on the Vltava river takes about 75 minutes and a one-way ticket costs 150 CZK ($6.00) from Čech Bridge, or 190 CZK ($7.60) from Rašín Embankment. You can buy tickets online with a 10% discount at praguesteamboats.com. 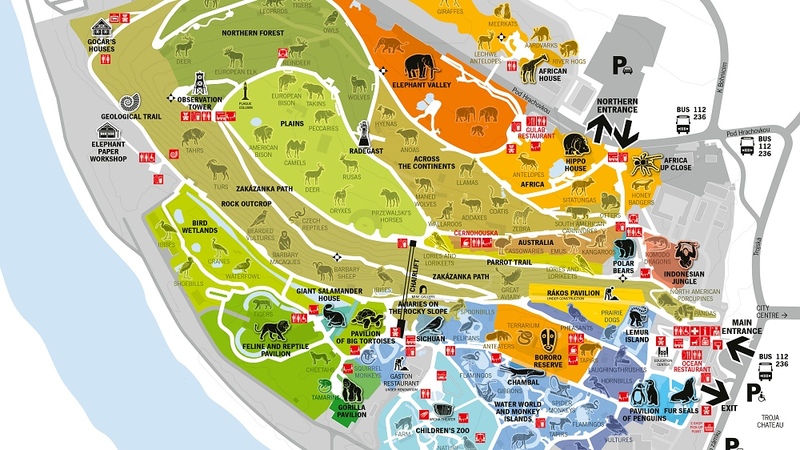 Before visiting you may also print/download the official ZOO map below. 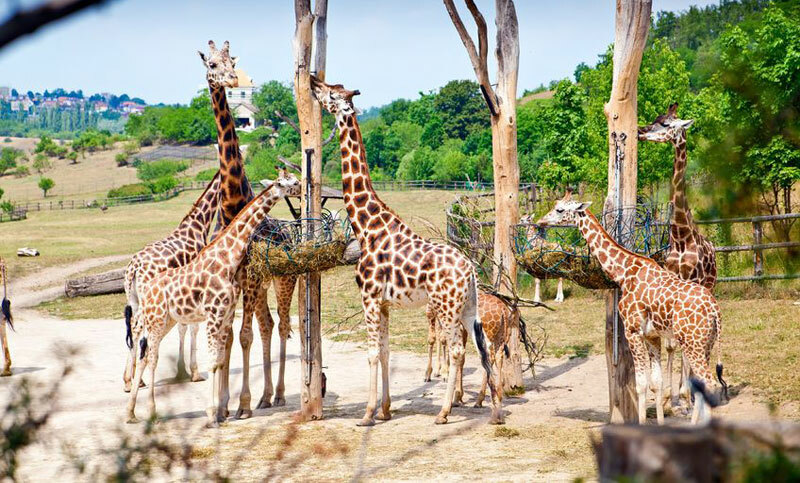 Apart from general admission, Prague Zoo also offers some special activities and entertainment programmes, such as commented tours or “A Keeper For A Day” program, allowing you to get acquainted with a selected animal in detail. Or you can, for example, enjoy a night walk with a professional guide. It is available upon order only – if you are interested contact the ZOO representatives (+420 296 112 230, pr@zoopraha.cz). You got names of gorilla’s wrong. Yes Richard is the adult male, but Bikira thought she had one little one, did not raise it, immediately after birth she put it aside and it is now raise in Stuttgarth I believe. Also Kamba didn’t have Nuru either. Kamba unfortunately didn’t ever have living child(gorila child) of her own. But after her stillbirth she started nursing and taking care of other little ones in group. But Nuru is Kijivu’s son. As is most of the Richard’s offsprings. Shinda had baby too and raises it. Please change the names correctly.